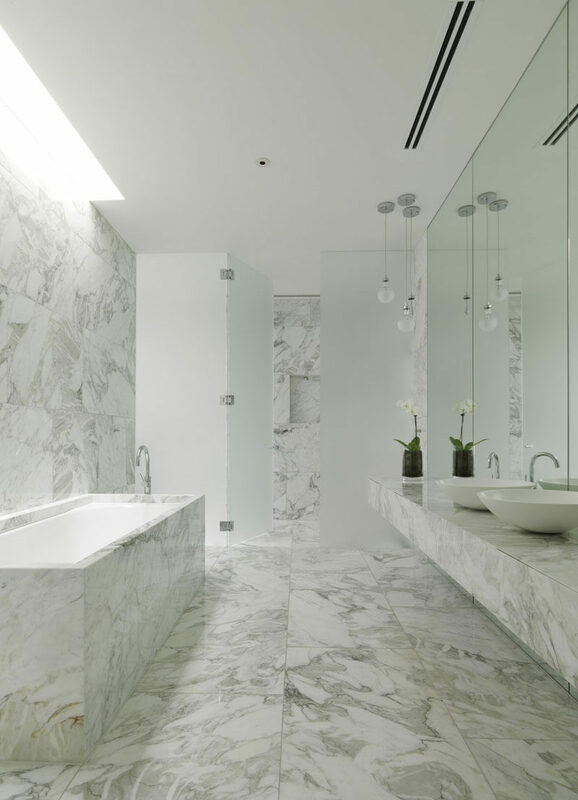 This bathroom has marble tiled floors, marble walls, a marble clad shower, and a marble surrounded bathtub. Partnered with the black hardware, this creates a neutral, calm bathroom. See more photos of this home, here. Designed by MIM Design. Photography by Peter Clarke. 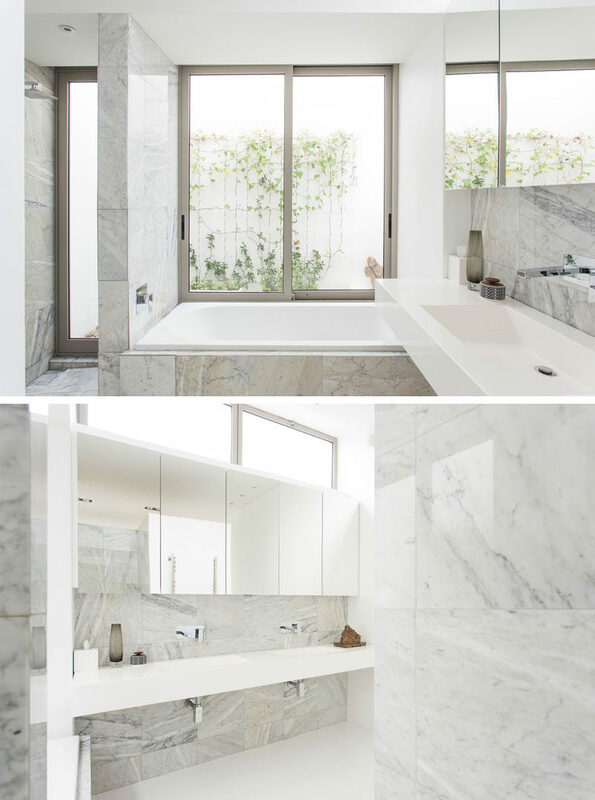 Lots of windows and the light color of the marble used on the walls, floor, and backsplash keep this bathroom feeling bright and airy. 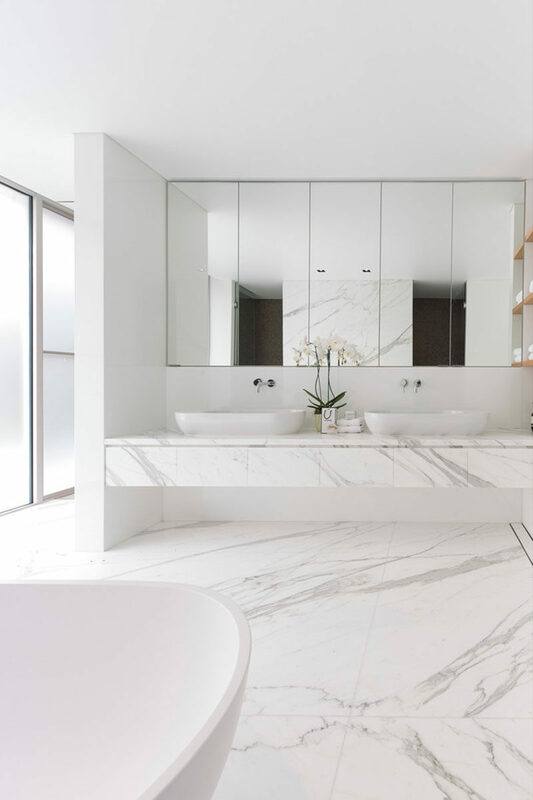 Marble covers the floor, walls, counter, and shower area of this bathroom, keeping it bright, clean, and modern. See more photos of this home, here. Designed by b.e. architecture. Photography by Trevor Mein and Peter Clarke. The only thing that breaks up the white in this bathroom are the grey striations in the tile on the floor and vanity. Designed by MHN Design Union. Built by Horizon Habitats. Photography by Brett Boardman. 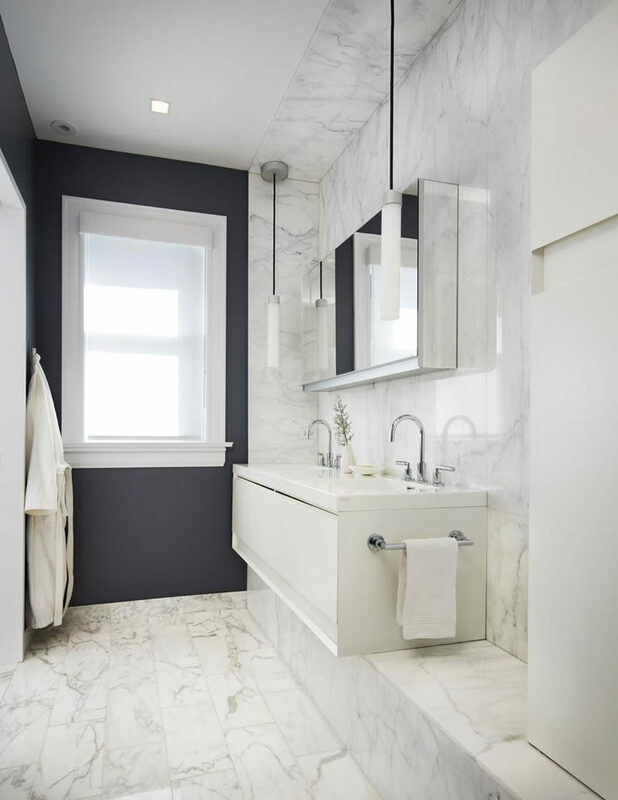 Even though the back walls of this bathroom are dark, the white in the marble brightens up the bathroom and helps make it feel airy. Designed by Mia Rao Design. 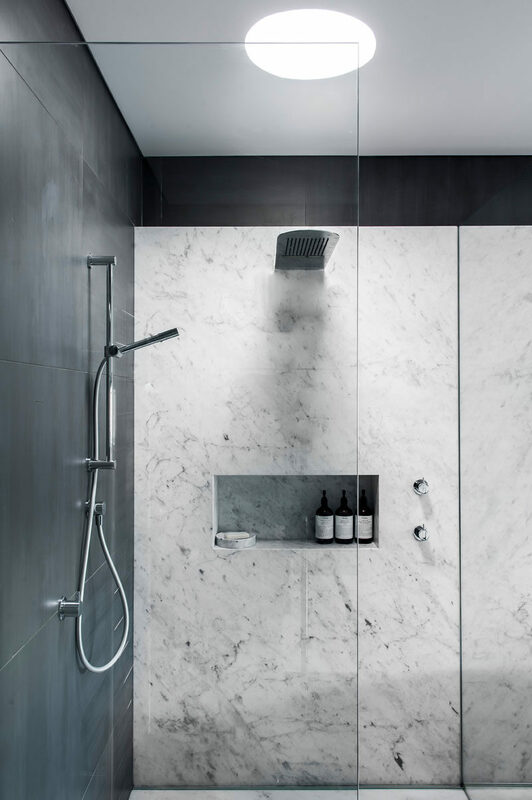 A marble shower amplifies your feelings of relaxation and turns your bathroom into a place you’re never going to want to leave. It’s elegant, it’s timeless, it’s marble. See more photos of this bathroom, here. Designed by Minosa Design. Marble doesn’t only come in white. 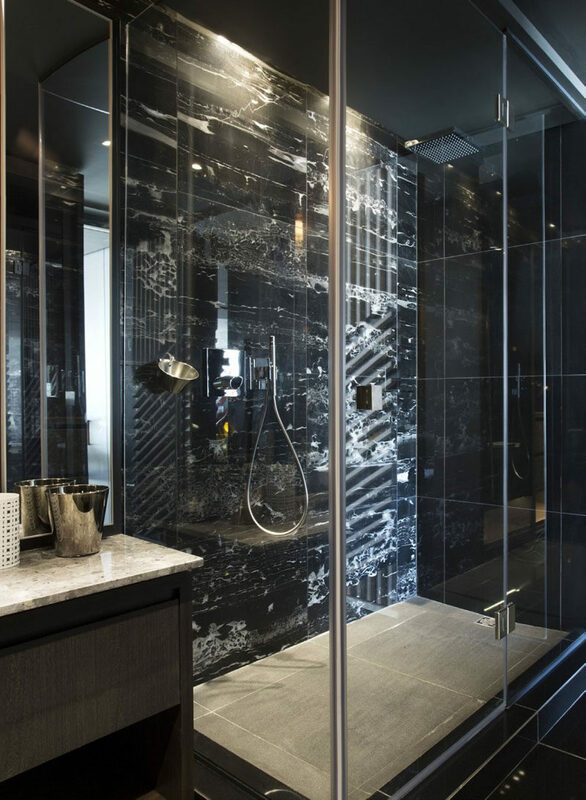 Black marble can be used to make a more bold statement while at the same time keeping the sophistication that comes with the material. See more photos of this home, here. Designed by Antoni Associates Interiors and OKHA Interiors. Relaxing in a stone tub takes your relaxation to a whole other level. It gets you closer to nature, creates smooth and luxurious place to unwind, and lets you spend longer bathing as it holds the heat longer. 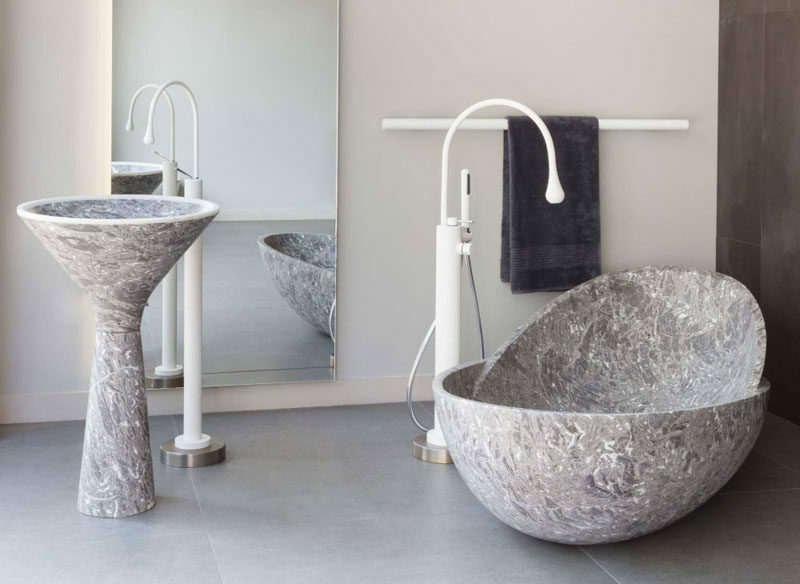 Marble tubs come in such a huge variety of patterns and colors that no two tubs are exactly the same. 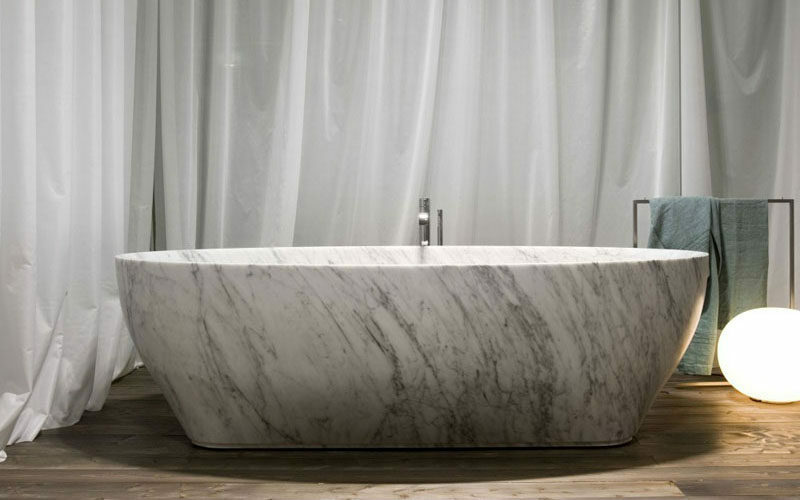 This angular marble bathtub provides you with a relaxing place to unwind after a long day. Because marble tubs retain the heat longer you can enjoy relaxing in the water longer than anyone else. 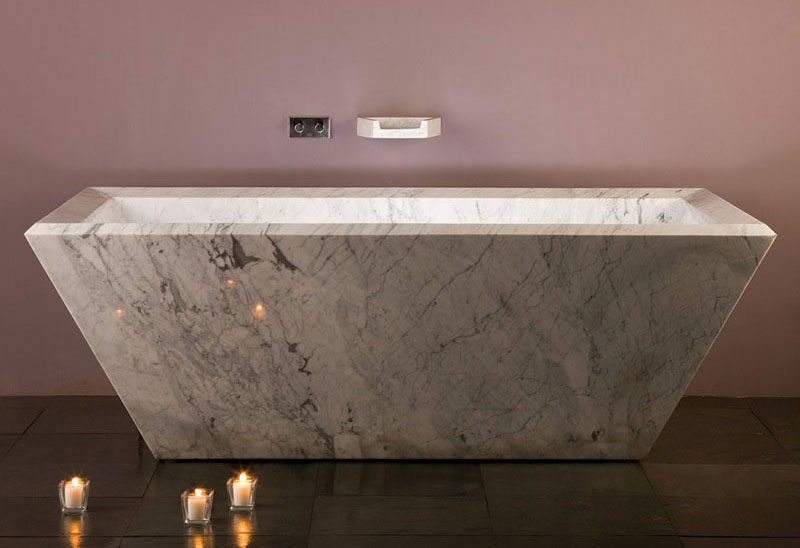 Unique in more ways than one, this rounded marble tub gives you the support you need while you unwind in the warm water. 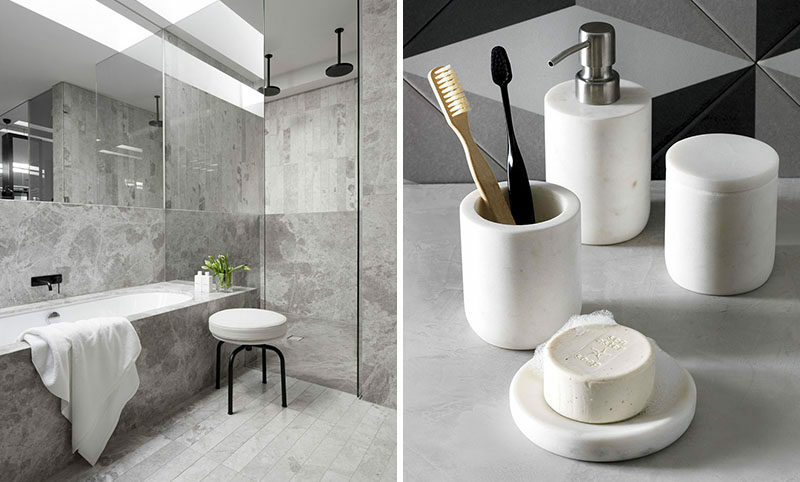 Perhaps the easiest way to get marble into your bathroom is in the form of accessories. 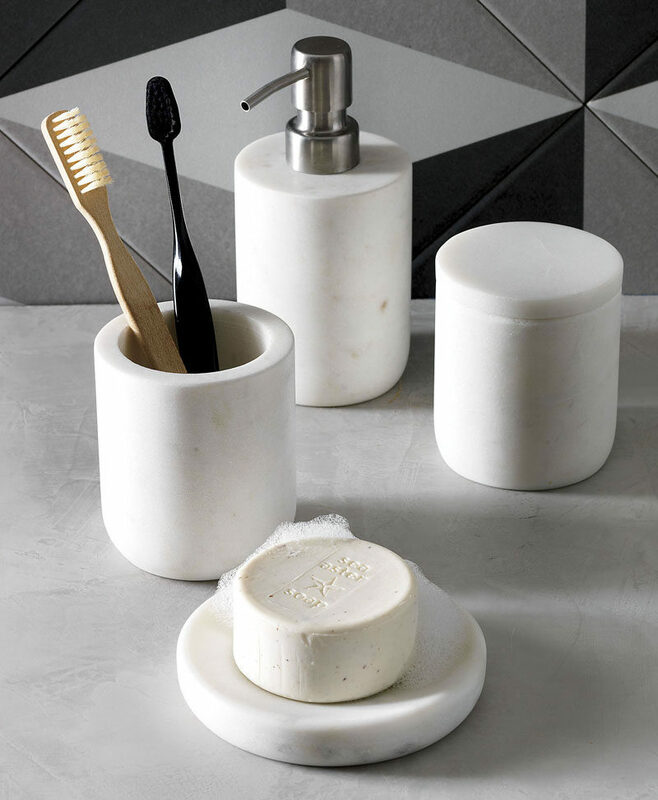 A marble toothbrush holder, soap ledge, or cotton ball container can all transform your bathroom into a sophisticated and glamorous spa-like oasis. Nothing says relaxation more than a candle lit bubble bath. 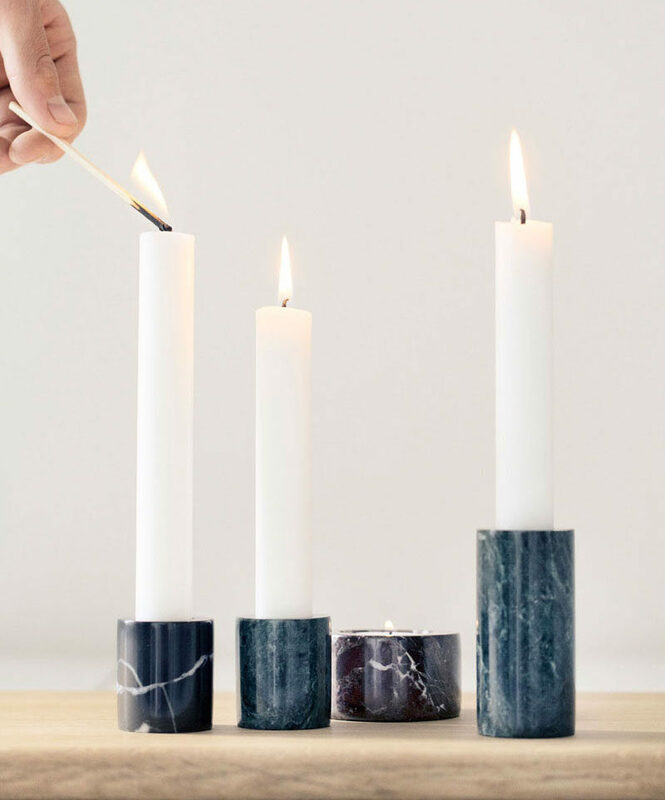 Marble candle holders can help get you there. 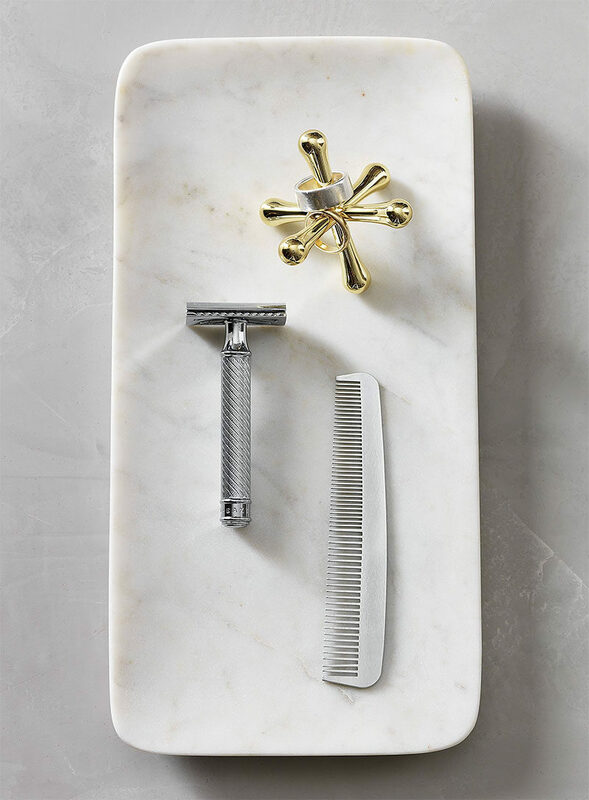 Keep all your bathroom essentials in one convenient space with a marble catch all tray.